Introduced in 1970 to compete against rival Two-stroke small capacity motorcycles, Honda 70 was one of the first Four-stroke small capacity motorcycle of its time with an engine displacement of only 72 cm³. This motorcycle was in fact a "Honda CD 70" but the models introduced from 1970 to 1983 were released and known as “Honda 70” as the logo “Honda 70” appeared on the side covers of the bike. Amazingly cheap, a genuine 40 miles (64 km) per liter. Solid as a rock, extremely reliable and a very practical commuter, no maintenance required whatsoever, this bike offered a 50 cm³ bike economy with the power of a 70 cm³ bike , In Belgium and Brazil this model made Honda very popular, in Asia (Specially Pakistan) Honda owes its huge success to this model. In Pakistan it earned the nick name “Rocket” for its ability to climb very steep roads with considerable loads despite its very small engine capacity (only 72cc) where rival Two-stroke usually failed. This motorcycle came fitted with a triangular speedometer with gear range markings and a maximum calibration of 60 mph (96 km/h). An interesting feature of this motorcycle was its ability to reach speeds of 60 mph (96 km/h), providing the rider psychological thrill of watching the needle pointing at maximum calibration on the speedometer even though the claimed top speed was 53 mph (85 km/h). 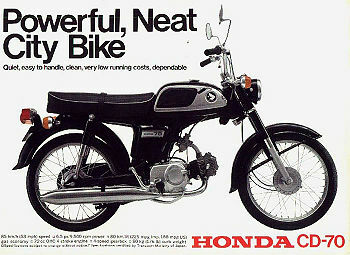 The engine was constantly upgraded and modified, in 1984 it was released as Honda CD70. This page was last edited on 8 September 2010, at 11:33.